Our Din Din Smart™ Stainless Steel Cup was designed with little hands in mind. Our Din Din Smart Stainless Steel 9 oz. Cup is designed with little hands in mind. Featuring a double lined wall and a plastic shell to help protect your child’s hands from hot/cold temperatures. With an ergonomic handle designed specifically for little hands, perfect when transitioning from a sippy cup to a big kid cup. 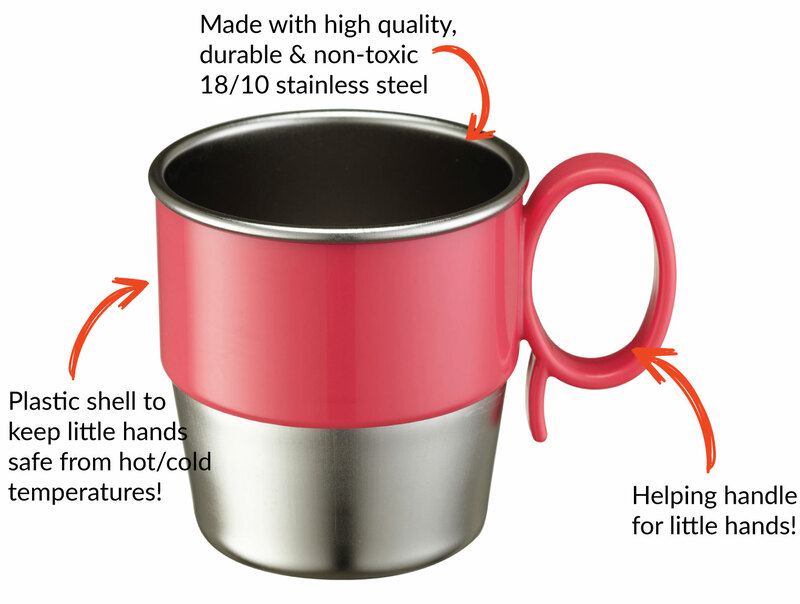 Our Stainless Steel cup is stain resistant, odor resistant, eco-friendly, and super easy to clean. Shop all of our Din Din Smart stainless steel products including stainless steel bowls, stainless steel sectional plates and stainless steel silverware on amazon.com. Made from high quality, durable, non-toxic Type 304 (18/10 stainless steel). Don’t forget to check out the matching Din Din Stainless products, like our sectional Bus Platters or Bowls! 100% SAFE FOR YOUR CHILD - The ORIGINAL Innobaby Din Din Smart™ Stainless Steel Cup is made of the highest quality, food grade 304 stainless steel (18/10 stainless) in South Korea. This product is nontoxic, BPA free, Phthalate free, PVC free and lead free. 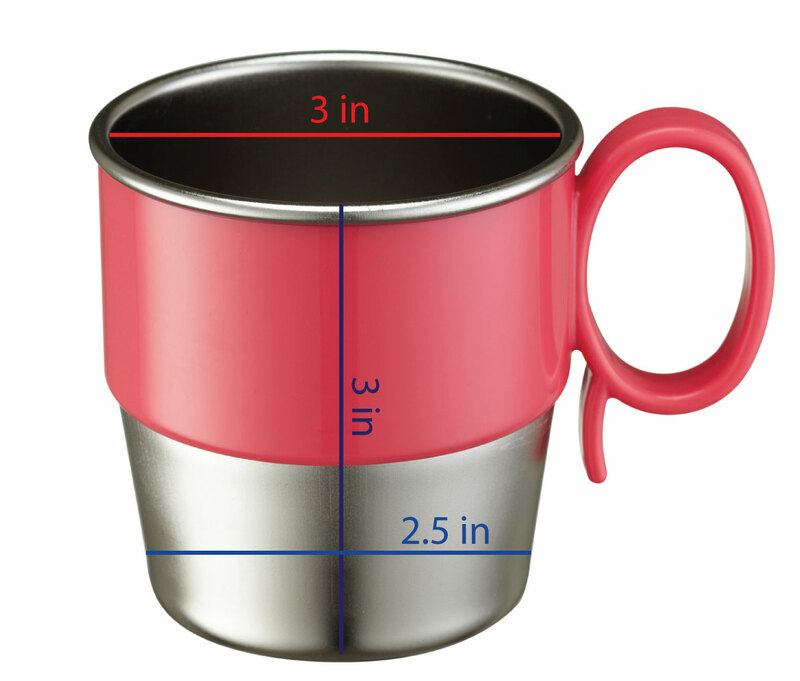 INSULATED CUP KEEPS DRINKS WARMER / COLDER LONGER AND PROTECTS LITTLE HANDS – The hard plastic outer shell insulates and keeps drinks at the optimal temperature longer while protecting your child’s hands from extreme temperatures. ERGONOMICALLY DESIGNED FOR TODDLERS - The Innobaby Stainless Steel Cup has an ergonomic handle that is easy for little hands to grip, great for transitioning from a sippy cup to a big kid cup. MAKE IT A SET– Innobaby has a complete line of stainless steel toddler feeding products including stainless steel tumblers, stainless steel bowls and stainless steel silverware. Chill for 5-10 minutes in the freezer before serving cool drinks. I originally got this cup for my 4 1/2 year old but little did I know that my 18 month old would want one too. Now they are constantly fighting over this particular cup, looks like I'll be buying one more very shortly. In the meantime, I would love to tell you how perfect it is for those little hands to hold it. It's perfect for warm tea or cold fruit punch. It is seriously one of the best kids cups I've ever owned. I highly recommend this product to all my mommy friends! I received this product with a discount in exchange for my honest and sincere opinion. This cup is great for keeping drinks cold and warm drinks warm. The only warm drink I put in it was hot chocolate for my older child; I wouldn't put anything too hot since it is made of stainless steel and the heat would be felt from the outside. This is the only cup I like to put milk in for my toddler because it keeps the milk cool and is easy to clean; there is so smell left behind after cleaning, which can happen with plastic cups. My kids love to use this cup for ice cream, since it keeps it cold, is deep enough to scoop out ice cream easily, and has a handle. It's a lightweight cup with an easy-to-hold handle, making it a great cup for my 2-year-old to use on her own. We already own 4 of these cups. My daughter is loving this cup! She loves that it is similar (just smaller) than her dads! Makes her feel like a big kid! Easy cleaning and non-destructible! It has a good grip for little hands! Din din smart stainless steel cup - perfect for preschoolers! My 3 (almost 4) year old loves this cup! He loves the handle and that it looks like a "grown up" cup since it's not all plastic. I love that it's easy to clean and won't break if dropped. I received this cup for my son who is 9 months old. The plan is to use it to help him transition from a sippy down the road. Right now we are using it for play time with his favorite ball! It is perfect for small hands and my son has no problem holding it. The only downfall is the metal leaves fingerprints easily which to me makes the cup look less appealing. Overall, great product! Ever since we got some cheap plastic mugs with handles as a gift at a party we have been looking for a more sustainable version of those cups. It's almost impossible to find toddler cups with handles that aren't all plastic until I found this. My boys love them they feel like big kids or like Mommy having coffee. They seem very sturdy and they're going to last a long time. Looking into buying the bowls. This little pink stainless mug is everything. It's small enough to fit in Iyada's little hands. She loves this little mug, it keeps her drinks cold, and if she drops it, it's ok. This mug is durable and I know it will be long lasting. I just got this in the mail and I love it! My son is learning to drink from a "big kid" cup and this cup is great!!! The handle is perfect for him to hold!! I love that his water stays nice and cold in this. It is great for ice cream too!! It keeps it cold and doesn't allow it to melt as fast as a regular cup or bowl!! This is a great cup for those little hands!!! I got this Innobaby Din Din Smart Stainless Steel cup for my son. He loves how is great for cold drinks to enjoy during the summer. The wide open mouth makes it easy to drink from. It is break resistant and with a house full of only boys this is perfect for little spill accidents.